IMI Contacts Exporter for Microsoft Exchange Server is small utility specially designed for Microsoft Outlook users to export Contacts from any Exchange Public Contacts Folder (or private Mailbox folder) to Microsoft Access table or Excel file. Key Benefits: Obtain information for Contact items from any Public Contacts folder in Microsoft Exchange Server 5.x/2000/2003/2007/2010; You can restrict exported items for lots of Contacts fields. IMI Contacts Exporter for Microsoft Exchange Server and Outlook. * Obtain information for Contact items from any Microsoft Office Outlook Contacts folder. * You can restrict exported items (add filter) for lots of Contacts fields. * For example you can apply filter, exported portion to includes only these Contacts, where Categories field contain "Key Customer" or Department field is equal to "Sales", or Last Name field starts with "Gubb"..
IMI Contacts Exporter to Microsoft Office Excel and Microsoft Office Access works on Microsoft Windows 95/98/Me/2000/XP/2003/Windows Vista/Windows 7 with a valid Outlook/MAPI profile. You can restrict exported items (add filter) for lots of Contacts fields. Please be aware MAPI/ADO are properly installed in your PC. Verify emails in Microsoft Outlook contact folders and mailing lists. Standalone address book for Microsoft Outlook contacts. 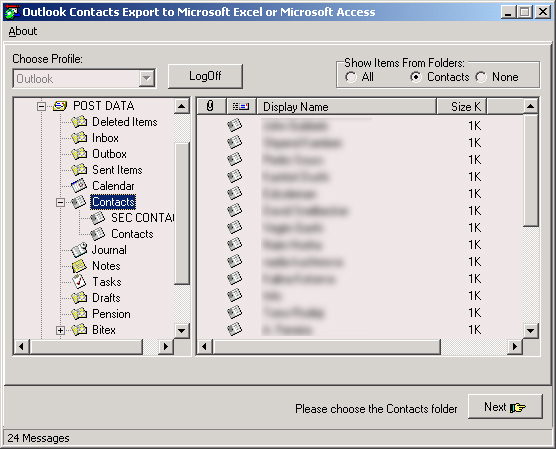 Synchronize your Outlook XP/ 2003 Contacts over E-Mail. Extract contact information from every web page visited automatically! Utility to import all contacts from popular web-mail services. Secures the viewing of sensitive information by mixing it with its background. Qweas is providing links to IMI Contacts Exporter 4.6.1.0 as a courtesy, and makes no representations regarding IMI Contacts Exporter or any other applications or any information related thereto. Any questions, complaints or claims regarding this application IMI Contacts Exporter 4.6.1.0 must be directed to the appropriate software vendor. You may click the publisher link of IMI Contacts Exporter on the top of this page to get more details about the vendor.